Just inside the sliding glass door of the overnight hut a few meters above Station 8 the entry way was where you needed to take your boots/shoes off. Around it the floor of the small building was built up about eight to ten inches. I inwardly groaned as I realized I was going to have to sit down to take my boots off and then, horrors, I would have to stand again. When my one boot just didn't seem like it was going to come off one of the attendants actually pulled it off for me. I guessed my feet were swollen but I wasn't worrying about that right at the moment. The English speaking attendant explained the procedure for my stay. It cost about $70 for the sleeping space and $5 dollars for each meal I wanted. 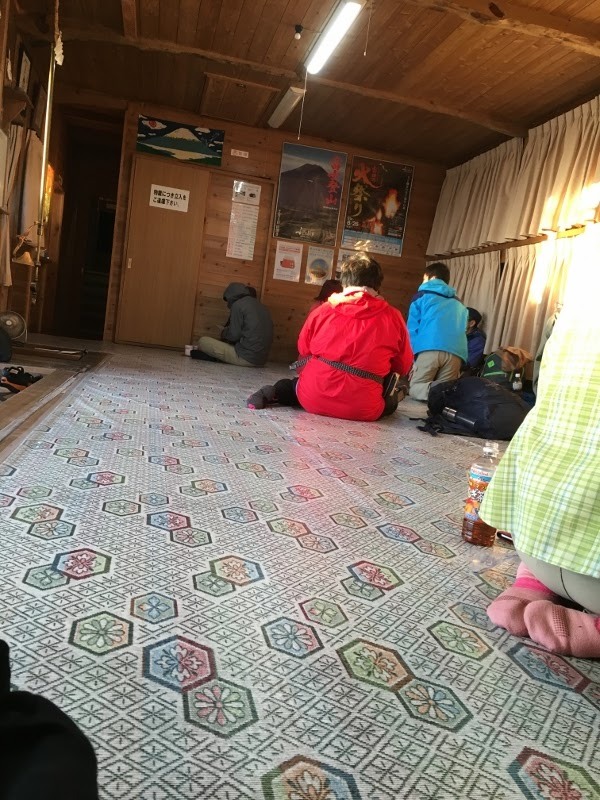 I saw people with several bowls of food in front of them for dinner who were sitting Japanese style around a table that was only about eighteen inches high. It looked like way more than I wanted to eat coupled with getting on the floor and up again and since there was also a snack place available I decided to just get breakfast. I paid the attendant and he brought my change and began to explain the rules of the house. No smoking inside. No eating in the sleeping area. Slippers (actually crocs) were available for use to go to the bathroom which was located across the walkway outside. You were not to wear them for star gazing. (This made me wonder since the only place to star gaze was outside between the hut and the bathroom.) No screaming. No setting an alarm to wake by. He would wake me at a time I wanted. Silence cell phones. Check out time was 6 AM. I managed to get to my feet as gracefully as I could and tried not to scream at the pain. The attendant led me into the sleeping area which was off the main room and had a heavy drape covering the doorway. It was a narrow room with what I can only describe as two long bunks that stretched the length of the room along both walls. About four feet of walking space down the middle. 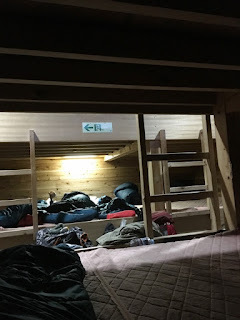 There was padding on the bunks covered with a soft blanket-like material and along the back of each wall were sleeping bags rolled up with a small pillow in plastic accompanying each. 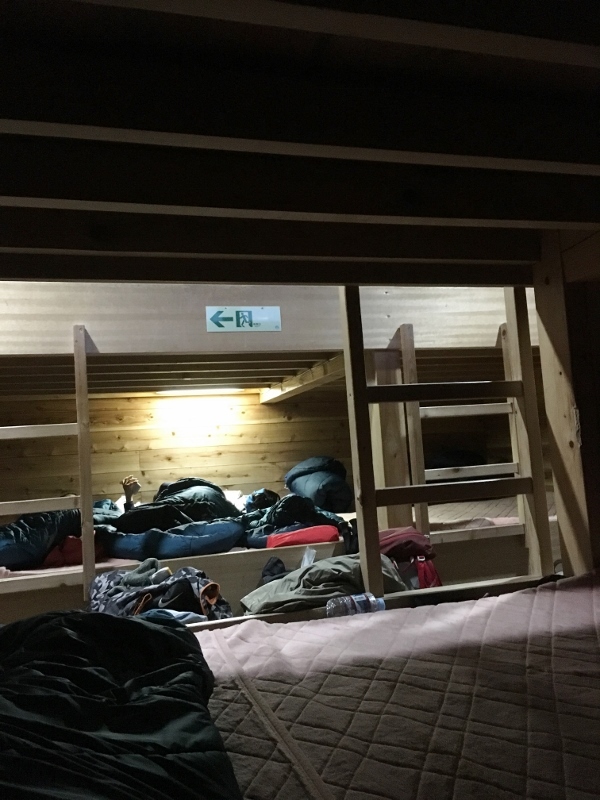 I didn't think to count them but since I was assigned the fourth bag from the right and was only about a third of the way down the wall, I'd guess there were a dozen down each bunk, top and bottom, making sleeping space for 48 in that small room. Most stops had western style toilets. Not this one. Once the sleeping bags were rolled out there was about eight or ten inches between them. Several people were already asleep a few bags down from me. I sat on the edge of the bunk for a moment to catch my breath and think about what I was going to do. It didn't take long to decide. I was bone tired. First a trip to the bathroom was in order. I padded in my stocking feet to the crocs, slipped a pair on and crossed over to the bathrooms. I searched the door to see if there was any indication of where the men's and where the women's bathroom might be only to realize they were one and the same. One wall held three urinals and the other three stalls. Okay, I thought, I can do this. I was the only one in there at the time. 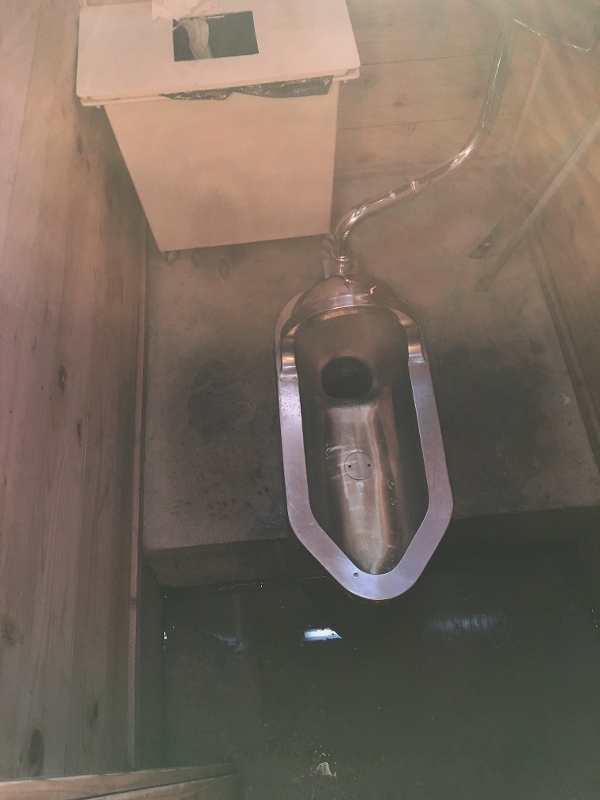 I opened the first stall and discovered a squat toilet. Second stall, the same. When I opened the third I realized there was no hope left. Without being too indelicate here let me just say the first trip to the bathroom was not a welcoming experience. There is no way for a Westerner to do that when she's in good shape let alone when all of her joints and muscles are screaming in pain. I did get creative later which included a more successful trip using a leftover cup with a hole in the bottom of it. Think funnel. It worked fairly well. While there was a small flush mechanism on the toilet, there was no sink to wash hands, just a small hanging tank outside the door that you could push up to dispense a little water for your hands. I thought it might be disinfectant but it had no smell so I'm sure it was just water. All of this luxury was at a cost of 200 yen a visit (about $2). Back in the hut, I rolled out my sleeping bag, grabbed my drier pants out of my backpack and slipped inside my bag to change into them. I figured I could take my shirt to the bathroom with me but I didn't want to change pants there and drag them through whatever might be on the floor. It was later I discovered that there was a changing area just at the back of our room that my attendant had neglected to tell me about. The view from my bunk spot. It was only a little after 6 PM but I decided I was too tired to even eat. I really wasn't hungry so I took out my contact lenses, wished for water and a sink to brush my teeth and then crawled into my bag. I went out quickly, woke a bit later as my neighbor lady crept into her bag and then fell sound asleep again. I slept until a little after 11 when nature called again. I inwardly groaned as I imagined the crawl out of the bunk and the toilet facility that awaited me. I made the trip pausing to stare at the stars for a moment. I hadn't left a wake up call but I didn't want to miss the sunrise. I was awake again at 2:30 and thankful no one had taken the sleeping bags on the one side of me. It was easier to climb in and out and the lady next to me had encroached a little. I checked outside for a hint of a sunrise. Not yet. I thought I might eat my breakfast since it was supposed to be ready at 9 PM and I could have it whenever I wanted. I asked for it but then decided I would wait a bit. It was two buns shaped like croissants and a packet of warm rice with a bottle of water to drink. I laid down for another hour but was too awake to fall asleep. I took my breakfast outside and bought a cup of coffee that was surprisingly good albeit expensive at $4 for a very small cup. The two buns were good but the rice did not have a very good flavor. I ate a few forkfuls and put the rest away. I figured I could eat one of the protein bars we'd brought along if I was still hungry later. It was getting a bit chilly even with my thick hooded sweatshirt on so I went inside to the hut and sat next to the little pit where pieces of coal were kept burning in order to heat the branding iron that is used to burn a design into the wooden souvenir walking sticks you could purchase at Station 5 and collect designs at each station or hut--for a fee of course. When I saw the promise of the sunrise in the morning sky, I went back outside with my phone to take pictures. 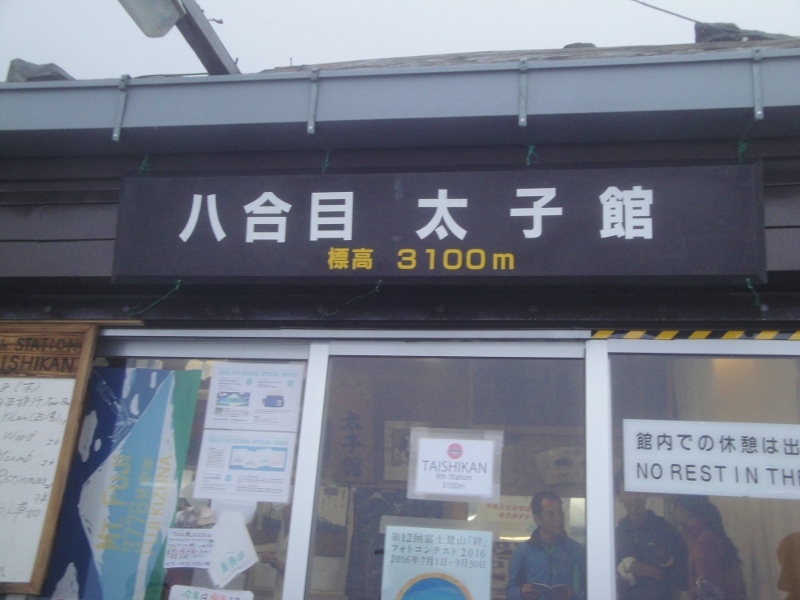 I wondered what the rest of my family was doing farther up the mountain.